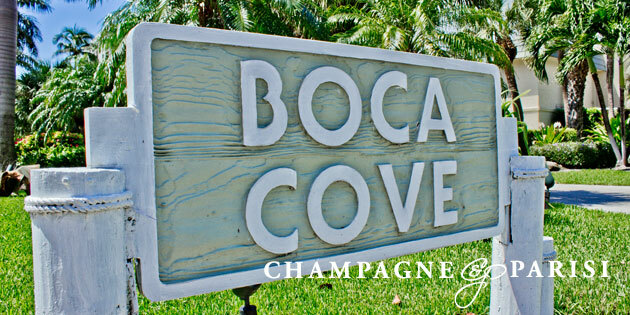 Boca Cove is an exclusive community nestled between the Intracoastal and Atlantic Ocean in Highland Beach, Florida. The waterfront Boca Cove community is divided into subdivisions of villas and townhomes, Boca Cove Villas and The Enclave at Boca Cove. 7 luxurious units comprise Boca Cove Villas and are located on the East side of A1A directly on their private beach with breath taking views of the stunning Atlantic Ocean. The Enclave at Boca Cove is much bigger with 42 townhomes backing up to canals and the Intracoastal just west of A1A on Russell Drive. Boca Cove Villas and Townhomes range in size from 1,500 square feet to 3,000 square feet and are built with between 2 and 4 bedrooms. Each residence has various features including vaulted ceilings complete with skylights, roomy floor plans, hurricane impact windows, private balconies, marble or hardwood flooring, French doorways, walk-in closets, walk-in showers, and top-of-the-line appliances. Boca Cove’s waterfront community is both peaceful and relaxing while allowing residents to utilize its various amenities. Some of these luxurious amenities include a private beach, clubhouse, gorgeous swimming pool, elaborate sundeck, game room, billiards room, fitness center, and BBQ area. This resort-style community has private boat docks that harbor home owner’s boats on deep water canals and the Intracostal waterway. Because there are no fixed bridges, Boca Cove residents have easy access to the sandy beaches, waterways, and waterfront dining that also offers space for docking.